That's packing foam, split apart like snow. 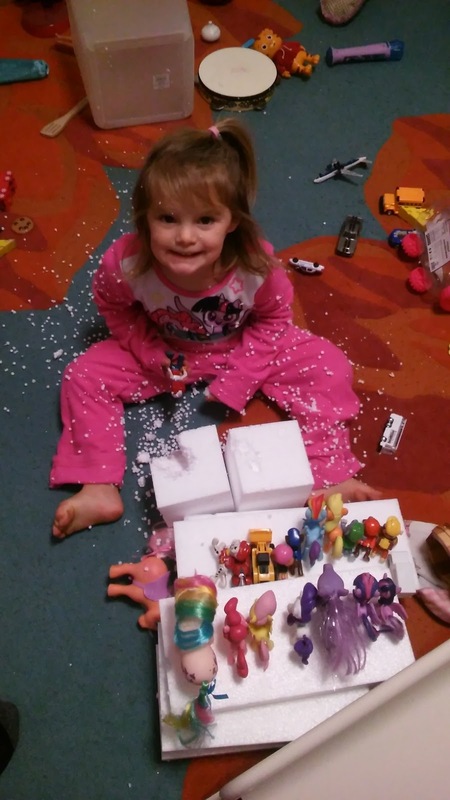 "I'm trying to make a party, Daddy!" she says. Of course she is. It doesn't look like a big mess in that picture, but it spread like a virus. I took this photo to show Katie, partly because it's funny, but partly to make her feel sorry for me while I was home for the kids. Guilt: the secret to every healthy marriage. So I grabbed the easiest thing to clean with: a hand vacuum. It died about one minute in. Then I started to clean with the real vacuum. It was too full and I had to walk outside to clear it. 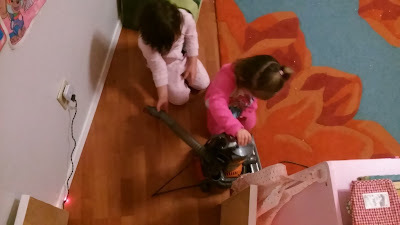 While cleaning up, I wondered if I should have made the girls help; but as many parents will say, it's honestly just easier to do it yourself, so I continued. Then I cut my hand on their play kitchen. Great, now I'm bleeding. The point of all this is, I had a lot of reasons to be upset tonight, but you know what? I wasn't. I felt fine. Maybe it was the whiskey I was sipping while doing the dishes, but more likely I think it was God's grace. His grace in empowering us to give grace to others, specifically. Sometimes we are supernaturally endowed with gifts from God, be it giving grace to those who don't deserve it, patience in slow moving times, a generous heart when your own bank account is lacking. It doesn't make any sense, but it's there, so it has to be God. Tonight was one such night, which I can say with confidence, because when it's bedtime and you've had a long day and the kids show up with something like this, anger and frustration are the first emotions I typically land on. But every once in a while something like this happens -- I don't yell at the kids, everyone stays calm, and sometimes, they even help clean up their own messes (see below). Now I can thank God for that. Helping each other vacuum? I'll take it!